Songs About Poets, is a series of physical and musical performances based on alternative research material about dead poets or writers. The T.D. archives is the first collection, inspired by the life of Danish author Tove Ditlevsen. 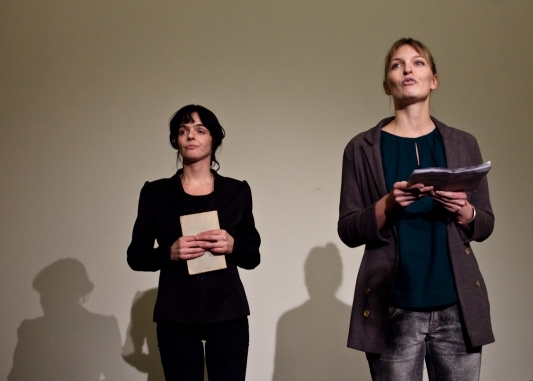 Each performance is created upon an intimate description of Ditlevsen or a document, such as a newspaper cutting or a letter, written in her own hand. Haslund has translated these texts into English and transformed them into songs to provide international audiences with insights into Ditlevsen’s exceptional universe. 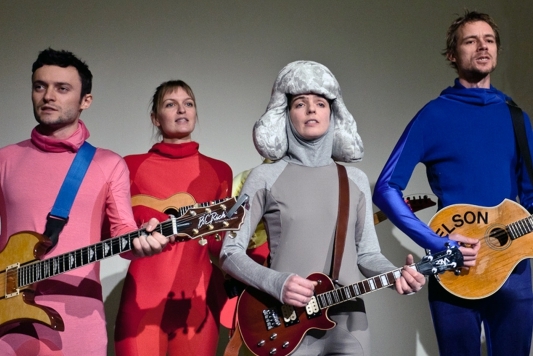 The idea to develop a complete performance collection surfaced in 2010 during preparations for a performance night in Tove’s Gallery, a small shopping arcade named after Tove Ditlevsen in the Vesterbro district of Copenhagen. Prior to this Haslund had inherited a book from her Grandmother in which she discovered a private letter from Ditlevsen. This letter became the basis of the first part of the collection: My Complete Female Mind. Haslund reveals new sides to Ditlevsen in the T.D. Archives, as she provides stories about the author with new meaning. They become relevant through interpretations that are built around humour, songs and contradictions. On the 21st of September 1974 Tove Ditlevsen was discovered in Rude Forest after a failed suicide attempt. A couple of weeks later, in the newspaper Politiken, she wrote the column “Princess Clara” about this attempt and included a nursery rhyme by Louis Levy. The column’s objective of glorifying suicide provoked the priest and author Johannes Møllehave into responding with an open letter. She answered him by stating that the text was poetic musing over the last minutes of her life and her failed suicide attempt. Accompanied by her ukulele Haslund introduces the life of Ditlevsen and sings the column text. Towards the end the song switches into the nursery rhyme “Princess Clara”. 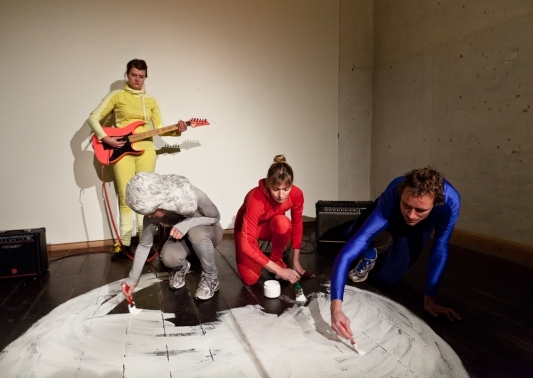 The performers collectively paint a circle on the floor and stand in it to refer to the first verse: “ON THE TOP OF THE CAKE - PRINCESS CLARA STANDS”. In Clara’s Run Haslund delivers Ditlevsens texts bringing forth the poetic and frivolous intent of the author’s column that met public criticism. An interpretation completely in compliance with Ditlevsen’s sense of humour and self-irony and contrasting the serious subjects of suicide and divorce. In her red boots, and feathered hat. With a spine made of wire. Molly Haslund inherited an edition of Tove Ditlevsen’s collection of poems, Kvindesind (The Female Mind) from her grandmother. In it she found a letter from Ditlevsen addressed to the grandmother. Apparently the two women got to know each other in their 20ies at some wild parties in 1942 that Haslund’s grandmother and grandfather hosted in the Sydhavn area in Copenhagen. The letter was written in 1955 subsequent to the publication of the poems. At this point the women are in their late 30ies. As Ditlevsen writes her books in Birkerød town, the grandmother moves to the city of Århus and works as a child psychologist. The two keep in touch. 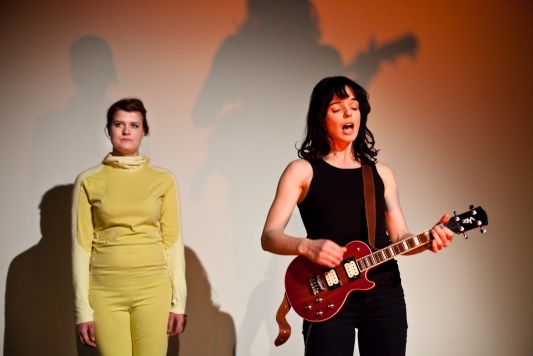 In her performance My Complete Female Mind, Molly Haslund tells the story of the letter and adapts the text to a rock song. The song pays homage to the two women, who have been very different role models for Haslund. 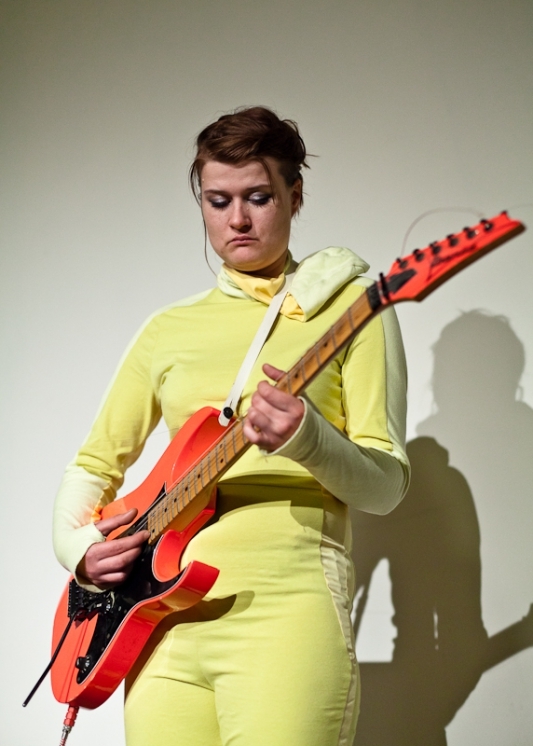 She plays the songs in rock chick style on an electric ukulele, and in doing so she joins the countless rock musicians who use the work of poets in their songs.